The history of letter writing began when Egyptians started using papyrus over 30,000 years ago. For thousands of years, letter writing was restricted to governments, merchants, and wealthy individuals. By the 1800’s, letter writing finally became accessible to the masses with the spread of public education, availability of affordable wood-based paper, and drastic reductions in postage rates. Recent technological advances caused a huge decline in letter writing, but it still remains an effective method of communication. Letters are useful for persuading an adversary, explaining complicated issues to a client, and submitting detailed proposals and replies. Letters also work well for personal matters like condolences, congratulations, and thank you’s. Read on for tips for writing professional letters that improve your communications. As a first step, consider whether to send a text message or email since they serve a different purpose than letters. Text messages are best for urgent communications, but they can be intrusive, misplaced, and misunderstood. Emails are less intrusive and work well for short requests, quick updates, and distributing information quickly to a large number of people. Letters are effective for communicating lengthy, complex, or confidential information. Letters must be carefully written since they are held to a higher standard of care than electronic communications. Consider using a hybrid approach of combining an electronic message with a missive by attaching a lengthy letter to a short e-mail introducing it. The next step is to consider your audience and what you are trying to communicate to it. If you are writing to an adversary, remember that the letter may be shared with co-counsel, clients, business associates, and family members. Remember the audience when setting the letter’s tone and content. For example, avoid legal jargon when writing to clients and avoid acrimony when writing to adversaries. After you write the letter, proofread by reading it aloud to assure that it maintains a high standard of courtesy and professionalism. Letters usually begin with contact information for the writer followed by the address of the recipient, date, subject, and a salutation. The body of letters should include an introductory paragraph explaining its purpose and conclude with a summary paragraph that includes a thank you. For sample formats, see the templates included in your word processing program or visit Purdue’s Online Writing Lab (OWL). For additional guidance on formatting, read the U.S. General Services Administration’s (GSA) Style Manual. The GSA’s Style Manual has a list of preferred methods for addressing letters and envelopes. The format varies depending on the recipient’s profession whether they are a member of the clergy, judiciary, legislature, etc. For example, insert Attorney at Law or Esq., the abbreviation for Esquire, after the last name when addressing a letter or envelope to a lawyer. Use the subject line like a newspaper headline. Convey the main point of your communication and include a reference to any relevant case, contract, or matter number. It is acceptable to address the recipient by first name if you know them personally (e.g. Dear John). When in doubt, address recipients more formally to avoid offending them by using a title (or first name) and last name (e.g. Dear John Doe or Dear Ms. Jones). For guidance, see the Forms of Address website recommended titles to use in salutations. For example, the title for a trial judge is Dear Judge whereas Dear Justice is used to address a letter to a member of an appellate court. To make a favorable impression, letters should be written on high-quality paper imprinted with a stylized heading at the top (a/k/a letterhead) that that includes your firm’s name, address, phone number, fax number, e-mail, URL, and logo. The letterhead should be printed with a font that is large and easily read. 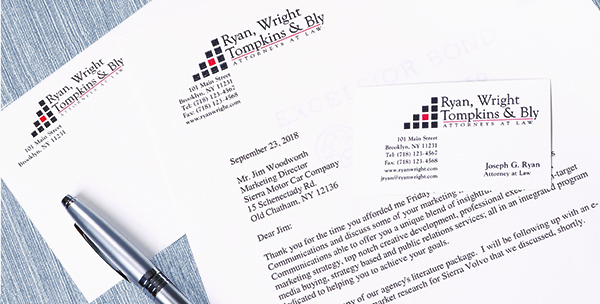 Consider hiring a consultant to design the firm’s letterhead and logo to keep a consistent image on letters, envelopes, invoices, business cards, and marketing materials. A well-designed letterhead shows recipients that your firm is trustworthy and reliable. In centuries past, letters were delivered by private couriers and state-owned messenger networks.Today letters can be delivered electronically (e-mail or fax) or physically (postal or courier service). Chose the method of delivery based on urgency and importance of proof of delivery. Remember to indicate the method of delivery in your letter above the recipient’s address with a statement like “Via E-mail and U.S. Mail”. Regardless of whether you use electronic or paper communications, remember to follow-up if you don’t receive a reply within a reasonable period of time. For many people, keeping up with electronic and paper mail has become a heavy burden. Mark your calendar with a reminder. Do not overlook the power of letters to inform and persuade. This article provides several tips that you can use to write professional letters that get results. For more tips, consult the GSA Manual and OWL website mentioned in the article. Share the article with your staff to encourage them to improve their letter writing and your firm’s image. 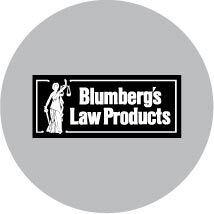 Blumberg has a proud heritage of providing products and services to lawyers for over 100 years. Blumberg’s stationery products include engraved and full color letterhead, envelopes, business cards, and note cards. Blumberg’s designers can help you design your stationery and logo to convey a distinctive and professional image. To order free samples or learn more about Blumberg products, call 800 221-2972 x1692 or submit an online request.